Forklift maintenance is important – and often overlooked. While many mistakes are the result of not paying attention, a lot of accidents are caused by a forklift not performing up to standards. Some harmful accidents can certainly be avoided by performing regular maintenance checks. The U.S. Occupational Health and Safety Administration (OSHA) classifies all forklifts (electric and gas-powered) as Powered Industrial Trucks. 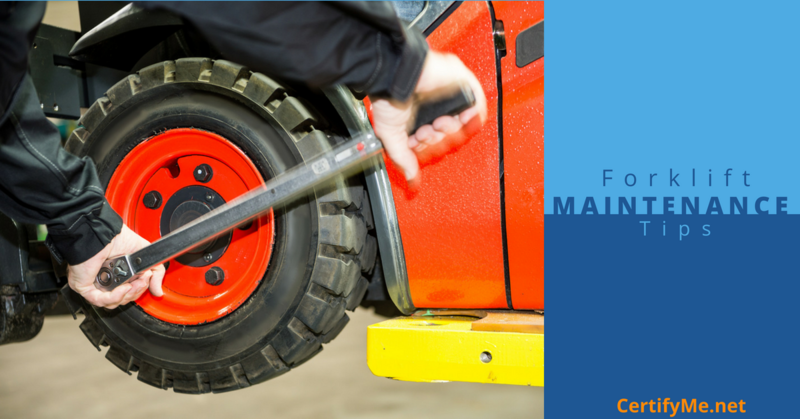 One of the most important safety checks with forklifts has to do with proper maintenance. According to OSHA, failing to adhere to a regular forklift maintenance schedule can cause costly accidents. 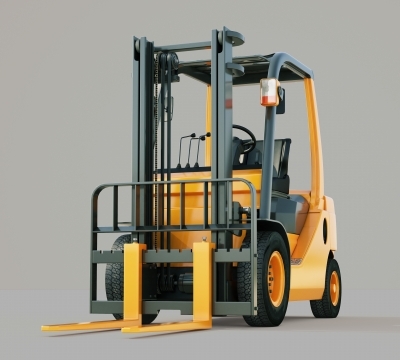 OSHA has a recommended forklift maintenance guide on their website, and many of these common sense safety measures are included with our training courses. If you ignore forklift maintenance, don’t be surprised if – more like when – injuries or accidents occur. As an experienced forklift operator will tell you, it’s always a good idea to create, maintain, and update your forklift maintenance schedule. Certifyme.net offers a full range of forklift training modules, which include methods for maintaining your forklift fleet. Many mishaps with forklifts can be avoided altogether with a sensible, easy-to-follow forklift maintenance plan. We’ll show you how to create and maintain an OSHA-forklift maintenance program as part of our training classes! Accident prevention: A good portion of forklift accidents are caused by driver negligence, but others are caused by improperly maintained equipment. If you want to avoid accidents on the job, keeping a regular forklift maintenance schedule is highly recommended. OSHA inspections: When OSHA visits your company, they’ll want to make sure all of your industrial equipment – including forklifts – meet the latest safety standards. If you don’t have a forklift maintenance plan, your chances of being cited or fined increase dramatically. This is one way a forklift maintenance plan can save your company money in the long run. Some OSHA citations can reach thousands of dollars in fines and penalties! Overall safety: A well-trained forklift driver is simply a better, more efficient forklift driver. And when you include forklift maintenance to go along with a fully trained staff, it’s a win-win for everyone. Safer drivers + safer equipment = a well-oiled machine! Some companies have mechanics and other maintenance workers to make sure their forklifts are running well. Other (smaller) companies may not have a dedicated maintenance department, so there are a few things you can you to make sure your lift is ready to go. And even if you have a maintenance crew, it’s still good to know about these maintenance tips. 1. Check tire pressure. Forklift maintenance starts from the ground up – literally. Improperly inflated tires can cause load shifts, bad turns, and other accidents. You can find the pressure on the tire or in the driver’s manual. It’s recommended to keep your forklift tire pressure equal to or just below the recommended pounds per square inch (PSI) rating. In colder months, aim for fully inflated tires. If your forklifts operate outdoors in hot climates, it’s OK to keep the tire PSI just below the recommended rating. For example, if your forklift tires have a 26 PSI rating, you can fill up the tires to 24 PSI, since the interior air pressure will expand slightly, especially in warm temperatures. 2. Make sure the safety features are in working order. Turn signals, backup signals, horns – these are very important for proper forklift maintenance. This is a very important element of forklift maintenance; if your turn signals or any other advance warning lights aren’t in proper working order, get them fixed immediately. If your company is visited by OSHA and any safety signals are broken, you could be looking at expensive fines or citations. If you follow a forklift maintenance plan, you have a better chance of ensuring that all your forklifts’ signals are in working order! 3. Do regular inspections. Most forklifts have their own maintenance schedule. But it never hurts to do your own regular (or even random) inspections. How are the fluids? What’s that noise when you make a left turn? Stay on top of the little things, and the big picture will take care of itself. Going above and beyond your company’s suggested forklift maintenance checks provides that extra layer of safety that’s hard to put a price tag on. 4. Check for leaky hoses. Even if you see a slight leak somewhere that does not look like a big problem, identify where it’s coming from and fix it immediately. Remember that leaks will only get worse over time. Hose checks should be part of your forklift maintenance schedule. If you’re not sure about which hoses to check, or suspect a faulty hose, check with your site safety supervisor immediately. 5. Ensure forks are straight. Your lift’s forks keep loads stable and help move & transport thousands of pounds of cargo every shift. Just one small bend in the forks will impact both performance and, more crucially, safety. Make sure those forks are good to go – if not, have them repaired or replaced. Just like a forklift requires good maintenance, so does a well-run safety program. If your company isn’t up to date with training and safety, big fines & penalties could be just around the corner. OSHA-compliant forklift training is our specialty at Certifyme.net. Beginner and veteran forklift operators can benefit from our training modules. With a flexible and affordable online format, we’re the preferred choice of small, medium and large companies all over the United States. Just some of our well-known clients include firms like Coca-Cola, Harley-Davidson, FujiFlim, Siemens and many others. For more information about our forklift training courses, please call us at (888) 699-4800. You can also visit our contact page to send a message or find other information. And don’t forget to visit our courses & pricing page, too! Certifyme.net also offers free lifetime renewals for all clients. This is especially helpful as your forklift drivers approach their 3-year training expiration date. OSHA requires renewal training after 3 years for all forklift drivers, from new employees to veteran forklift operators. This helps ensure that all of your workers have the proper credentials to operate powered industrial trucks. Combined with an up-to-date forklift maintenance program, and your company is ready for any OSHA inspection – and better yet, you’ll have the extra peace of mind knowing that all of your workers have the latest safety training to perform their tasks with 100% confidence! Hopefully, these maintenance tips will benefit your forklift’s performance and your overall value to your emloyer. Thanks again for reading the CertifyMe.net blog! Check back for more helpful tips on forklift maintenance, OSHA guidelines, worker safety and other issues that matter to you and your company. Looking for More Forklift Maintenance Tips? It’s a tough decision for maintenance supervisors, safety personnel, and forklift drivers – when is it time to repair or replace your forklift? In order to perform to the best of your ability, your forklift should perform optimally. If it isn’t, you should evaluate all the different aspects of your lift’s current condition, work history, and recommended forklift maintenance checks. In this post, we review some of the most important elements of your forklift’s condition. OSHA’s own forklift safety check and maintenance guide is a valuable resource in this regard. Along with OSHA’s recommendations, CertifyMe.net shows you some critical checkpoints to review, including tire wear, fork conditions, safety attachments, hoses, tank inspections, and much more. Read it today, and you’ll have a much better idea when your forklift is due for maintenance, repairs, or replacement! This article was originally posted in 2014 and updated in 2018 to provide more tips and recommendations.